Just this morning, my mom was admitted to the hospital for the continuous chest pain she has been feeling the past week. To some, this may elicit gasps, maybe a little shock, and an enormous amount of concern. To me, this is old news. Not that I am not concerned with my mom's welfare, I am and severely at that; it's just that her being confined to the hospital because of her heart ailments has never been new to me. She has been going in and out of such gloomy institution for the past months now, and I've learned to adapt (not that I want to) to the situation. For the longest time, my family has been battling it out with various sicknesses of different levels. My mom, at a very young age, had been diagnosed with heart ailment. Her blood pressure tends to rise more that usual, even when relaxed. And just recently, her heart was seen to enlarge at a slow rate. She also has diabetes, taking in maintenance drugs to control her blood sugar when reaching past the heavens. Add to her very elaborate medical history the two major operations she had undergone for the past five years: one with her gall bladder and the other with her ovaries. My dad, never to be outdone, had just recently undergone a major operation, which also led to the discovery that his blood sugar is way high and that he is in the onset of being a diabetic himself. I myself am undergoing therapy for my knees, which have been giving me significant pain for months now, disabling me from doing certain activities and limiting my already-limited physique. So you see, health problems are never new to me. I have been used to the sight of sickly people in emergency rooms, have made friends with doctors and nurses in clinics, and have been at home in both hotel-like and dreadfully looking hospital rooms. With that, my constant prayers have always revolved around healing and recovery of my loved ones and myself. But God has His ways. It couldn't have been any more timely. 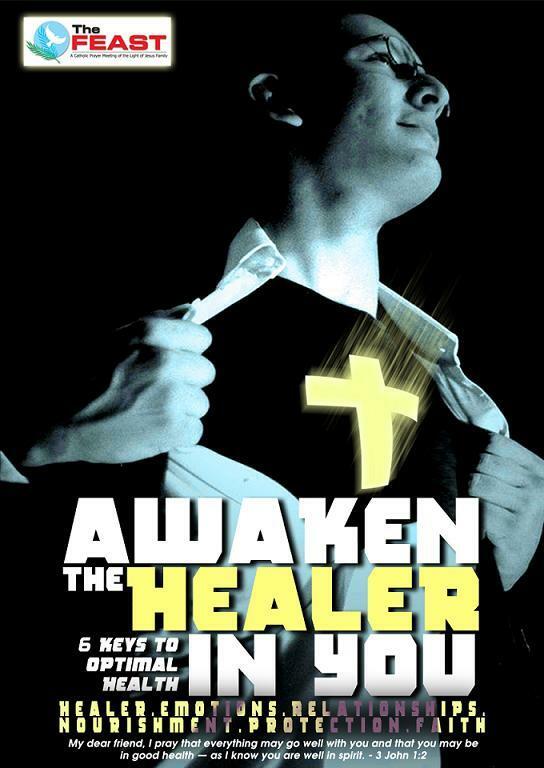 Yesterday, at the South Feast*, a new series entitled Awaken the Healer in You was started. The series is broken down into six parts: Healer, Emotions, Relationships, Nourishment, Protection, and Faith. Each talk intends to teach us to bring out the healing power within us. With that promise and with my constant petitions for healing in my family, I know that this new series will help me tremendously. My body is God's home address, and I know that God wants to heal me. I am ready to be healed and to heal. That's the spirit! As we learned in the talk the power of expectation is enormous.